A week ago today I visited E1, a mountainous patch of land east of Jerusalem that is famous because the Israelis have designated it for more settlements that will further fragment the West Bank and limit Palestinians’ movements, as the State Department has repeatedly stated. In E1, I witnessed the results of the recent Israeli bulldozing of a Bedouin village in which 47 people lost their homes. You can see Mohamed Odeh S’eedi in the video above, showing me through portions of the devastated village, Az Za’ayyem. Scores of Israeli soldiers arrived in the village with three bulldozers at 8 AM on Sept. 11. Then Israeli civilian officials in plain clothes went through the homes, removing personal belongings. After that the bulldozers and soldiers moved in, smashing one home and animal shelter after another, 18 in all, folding and warping roofs of corrugated steel. Thirty-two children lost their beds. You mentioned E1, in particular. I think that is an example of at least a public statement by the Israeli government that would be very difficult to square with a two-state solution. And I’ve said that to Prime Minister Netanyahu. I don’t think that’s a secret. But Obama and the State Department have had nothing to say about this demolition — nor about Israel’s demolition of Mak-hul, a Bedouin village in the Jordan Valley that European diplomats sought to relieve last week. A week ago in the arid, panoramic terrain of E1, Mohamed Odeh S’eedi took me around his smashed-up village. He pointed out an Israeli police station overseeing the occupied territory from a northern hill. He showed me the reservoir that Israelis are building to bring water to settlers. 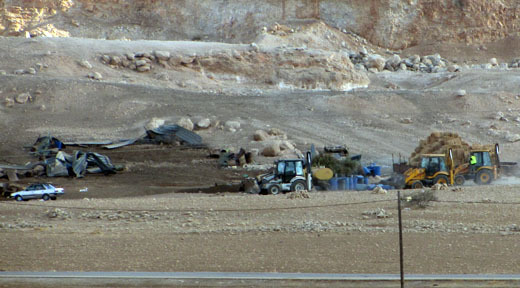 He pointed out the rocky hillside where the children of the Bedouin village sat, watching their houses being torn down. “They will never forget this.” Three tents had been set up, with bedding for 47 people. Three camels sat in the sun near us. Az Za’ayyem is a herding community. It depends on goats and camels to produce milk. The Israelis had targeted the heart of the community’s agricultural operation: a 1200-square-meter barn for farm equipment and goats. We sat under a tree drinking tea, and Odeh S’eedi said he had only one request of me: To bring the demolition of Az Za’ayyem to the attention of the world. He didn’t want money or aid; he seeks fair treatment. In this second video, you can see him showing me documents proving that the S’eedi family owns the lands on which their property was destroyed. Angela Godfrey Goldstein of the Jahalin Association also accompanied me. The NGO works for thousands of members of a Bedouin tribe, the Jahalin, who were forced out of the Negev during the creation of Israel. More than 2000 of these refugees live in the hills east of Jerusalem. “There is ongoing pressure being applied by the Israeli authorities to Bedouin communities in the Jerusalem periphery, both in and around the area earmarked for the E1 settlement construction project. As we know, these communities are targeted for transfer to locations outside the so called ‘Ma’ale Adumim bubble’. Administrative demolition has a severe psychological and economic impact on Palestine refugees throughout Area C, and in the case of the periphery where communities face the additional threat of full transfer, stress levels are now high as administrative demolition increases in the area. Godfrey-Goldstein and I also visited the Israeli settlement city of Ma’ale Adumim. It is thriving. You walk through an air-conditioned shopping mall past fountains, grassy median strips and date palms being tended by gardeners. Religious families push double-wide strollers alongside late-waking hipsters in flipflops. Ma’ale Adumim has the feeling of a suburban subdivision in the southwest in the U.S.
And day by day it is choking off the Palestinian communities in East Jerusalem, as the settlement builds stronger connections to the city. It is of course a violation of the Geneva conventions to transfer civilian population into occupied territories. But Israel has been massing Jews into East Jerusalem for more than 40 years, surrounding the Mount of Olives. The indigenous Palestinian communities are separated by high walls topped with barbed wire, and Godfrey-Goldstein pointed out to me a tunnel that was being excavated, connecting the East Jerusalem neighborhoods to a road going north and west to Ramallah. This is the architecture of apartheid. And the demolition of Az Za’ayyem is the latest fruit of a policy of Judaization and colonization, in defiance of American foreign policy. QUESTION: Are you aware of the new Israeli settlement activities that are taking place, in fact, today near Hebron? MS. HARF: I haven’t seen those reports, no. QUESTION: Do you have any comments on – the Israelis are taking some agricultural land that has been for hundreds of years and so on. MS. HARF: I’m happy to look into it, and if we – obviously, our position on settlements hasn’t changed. But I’m happy to look into it, and if we have additional comment, to get it to you. P.S. Today I received an announcement from Jewish Voice for Peace of a protest of a related policy, Israeli expulsion of Bedouin communities in the Negev under the Prawer Plan. Jewish Voice for Peace-Boston will protest Israel’s planned expulsion of over 40,000 Bedouin people, constructing a ritual “Sukkah” shelter outside the Israeli Consulate to mark the Jewish holiday of Sukkot and to simulate the Bedouin homes facing demolition. Non-Jewish allies will join the protest as part of a nationwide mobilization to defend the Bedouin homes, villages, and homeland. 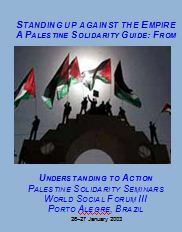 On June 14, 2013, the Israeli Knesset passed the first of three votes approving the Prawer Plan. The plan would displace an indigenous population of Bedouin – Arab Israeli citizens – from their current villages in the Negev desert, which are unrecognized, unregulated, and denied access to water, electricity, and schools. The Israeli government would seize land for new military bases, industrial sites, and communities for Jewish Israelis, forcibly moving Bedouin people to government-sanctioned settlements. The Prawer Plan has sparked protests throughout Israel, Palestine and the world; United Nations Human Rights Chief, Navi Pillay stated that “if this bill becomes law, it will accelerate the demolition of entire Bedouin communities, forcing them to give up their homes, denying them their rights to land ownership, and decimating their traditional cultural and social life in the name of development.” The bill is predicted to go up for a second vote this October. Bedouin leaders and human rights groups hope to create an alternative plan to address issues pertaining to Bedouin citizens living in the Negev. Jewish Voice for Peace’s Sukkot demonstrations (taking place in cities across the country) aim to join worldwide activists, including Jewish organization T’ruah, the Rabbinic Call for Human Rights, in pressuring the Israeli government to stop the Prawer Plan and associated human rights violations. Boston activists will also place phone calls to Israeli Consul General Shai Bazak, asking him to pass their concerns to the government of Israel. September 25th, 2013 is the last day of the seven-day Jewish holiday of Sukkot, when Jews construct temporary dwellings called sukkot (singular: sukkah). The sukkot symbolize the huts in which ancient agricultural workers resided during harvest season. Jewish peace activists will perform a ritual in the sukkah, as is traditional, reflecting on the right to housing for Jews and for Bedouin. WHERE: Outside the Israeli Consulate at 20 Park Plaza, Boston, MA. WHAT: Jewish peace activists and allies will construct a traditional sukkah and perform a protest in solidarity with Bedouin facing displacement from their homes, incorporating observance of the Jewish holiday of Sukkot. VIDEO IMAGES/SOUND: Demonstrators will hold protest signs and Jewish ritual objects, recite traditional Jewish songs and prayers, and engage in a Sukkot ritual in a “Sukkah” dwelling.